Have you been waiting to participate in a run which is driven by fitness individuals? We introduced this running event with a group of 5 runners and eventually, it has scaled to more than 300 runners. 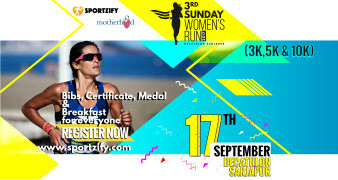 Motherhood presents a running event on 3rd Sunday of every month to promote the health and fitness of all the women in Bangalore. A loud call to all the men and women runner to come and join the fun and be a part of this amazing group of passionate runners. Don't miss the chance of meeting the health experts from Motherhood who will guide you for a healthy lifestyle. Motherhood brings this event in association with Sportzify (Event Organiser), Decathlon Sarjapur (Venue Partner) and KNS Infrastructure Pvt Ltd (Merchandise Sponsor). Entry Fees is just Rs 200/300/400. Finisher Certificate & Medals for all the participants including both men & women. Run starts at 6:30 AM from the Decathlon Sarjapur entrance gate. Bags can be kept at the billing counter inside the store. The Route Map will be shared 2 days before the run. This Event is over now.